Proven Technology that has been around for over 50 years. Our solution is based off of spectroscopy, which is simply how matter interacts with radiation. In our case, near-infrared (NIR) light. NIR spectroscopy has been used in the manufacturing industry for decades, permitting manufacturers better control over the quality of their products. It has been used for over 50 years in the agricultural industry, and pharmaceutical corporations have been using the technique, with the approval of the FDA, to monitor metrics like active product ingredient in medicines. NIR light – that region just beyond the red light that our eyes can see – has become increasingly popular because it contains a wealth of information and can be measured very quickly. The Beacon and Luminary Profiler use the most information-rich portion of the NIR range (1500 – 1985 nm), where chemical features are significantly more pronounced and immune to unimportant factors like the cannabis strain or color. 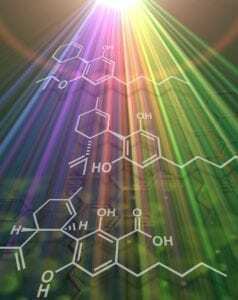 The use of light as an analytical tool affords a number of distinct advantages over alternative methods, such as GC or HPLC. Because light is non-intrusive to the process, spectroscopy-based measurements require no toxic chemicals for sample prep or analysis, leaving the sample intact for future use. Spectroscopy-based measurements save time, money and resources, as well as limit potential variation that can arise from extensive sample handling and processing in chromatography methods. Ultimately, this means fast, repeatable and accurate data collection every time.